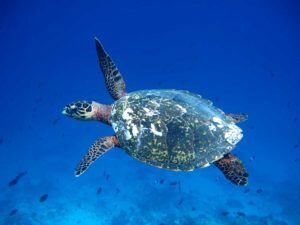 Home Blog Why Are Hawksbill Turtles Critically Endangered? 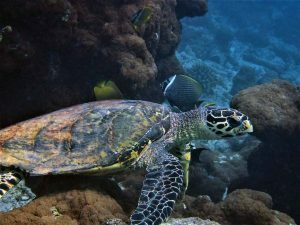 Why Are Hawksbill Turtles Critically Endangered? Hawksbill turtles are currently classified as Critically Endangered by the IUCN (the global authority on the status of the natural world). Alongside Kemp’s Ridley’s, they are believed to be the most endangered of the seven species of sea turtle, with only approximately 8,000 nesting females left globally. The critically endangered hawksbill turtle faces many threats; here we explore just a few. Hawksbill turtle swimming in Maldives. Hawksbill turtles (Eretmochelys imbricata) are amongst the smallest of the seven species of sea turtles. Adult hawksbills reach approximately 70-90cm in length and typically weigh between 45 and 70kg. They are easily identifiable by their unique carapace, the scutes of which overlap. Their narrow heads and beak-like jaws (from which they get their name) allow them to forage in the crevices of coral reefs, where they feed predominantly on sponges. Hawksbills reside throughout the central Atlantic and Indo-Pacific regions. In the first few months of life, they inhabit open ocean environments. They take shelter under drifting algal mats, however recruit to coastal foraging areas once they reach approximately 20-25cm in length. 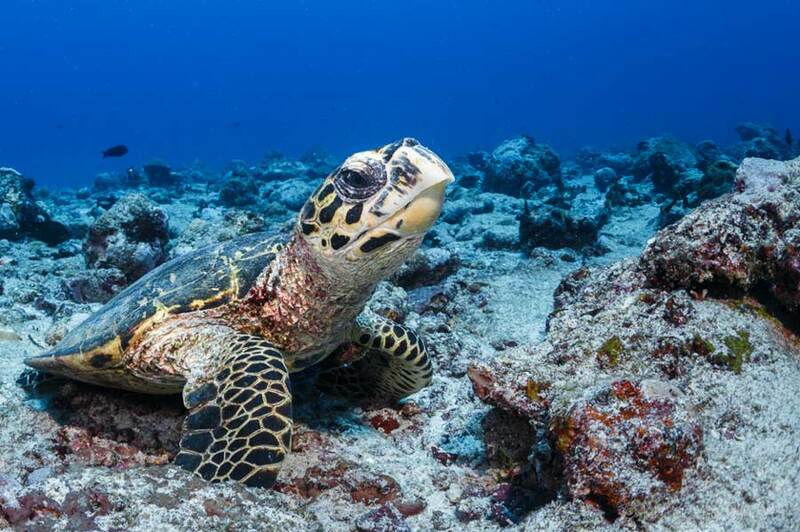 For thousands of years, Hawksbill turtles have been prized for their beautiful carapace. Their scutes, streaked and marbled with amber, yellow, black and brown (tortoiseshell), are fashioned into jewellery and other decorative items. In the last 100 years, it is estimated that millions of Hawksbill turtles have been killed to supply the tortoiseshell markets of Europe, the United States and Asia. Currently, despite domestic and international trade bans, the tortoiseshell trade remains a pervasive threat in the Americas and South East Asia. In addition, hawksbill turtle eggs are harvested for human consumption, with many cultures believing the eggs have aphrodisiac qualities. However, there is no scientific evidence to support this. In fact, extensive research suggests that sea turtle eggs contain high levels of pollutants, bacteria and parasites, which may actually lower fertility. Similarly, sea turtles are harvested for their meat, which is considered a delicacy in many cultures. Unfortunately, fishermen targeting lobster and reef fish will often take hawksbill turtles if encountered. In some areas turtle meat is also harvested for use as shark bait. The World Health Organisation (WHO) cautions against the consumption of hawksbill turtle meat. 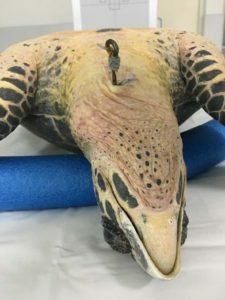 Hawksbills feed predominantly on toxin-containing sponges, which, if consumed, can result in neurotoxicity, kidney disease, liver cancer, developmental defects in unborn children, and even death. Despite this, harvesting hawksbills for human consumption still continues, albeit to a lesser extent. Unfortunately, in many countries, hatchling hawksbill turtles are taken from nests and kept as pets. 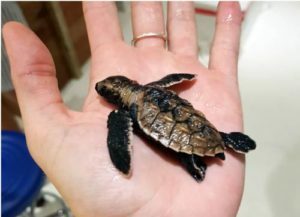 These hatchlings are typically kept in small tanks of fresh water (rather than saltwater), are given inappropriate food, and are handled too often. When hatchlings hatch naturally and run to the sea, they somehow imprint the location of their natal beach. This allows them to return to the same beach and breed later in life. Hatchlings taken from their nest and kept as pets are robbed of this imprinting, which may affect their ability to return to their natal beach. Captivity may also reduce muscle development and increase the risk of disease transmittance. Accidental capture in fishing nets and by fishing lines (bycatch) is a huge threat to all sea turtles worldwide. Each year thousands of sea turtles are captured, injured or killed in fishing gear. Most turtles drown when captured, however little is known about the fate of injured turtles that are accidentially captured and released. At the ORP Marine Turtle Rescue Centre in the Maldives we regularly see hawksbill turtles with fishing hooks embedded in their throats. We do not know if they were victims of illegal turtle hunting or accidentally got caught. Luckily we have been able to surgically remove the fishing hooks and release the patients back into the ocean once they recovered. What we do know is that they would not have survived without help. Ghost nets are commercial fishing nets that have been lost, abandoned or discarded at sea. These ghost nets will often be taken by oceanic currents and travel huge distances. All the while they continue to catch and kill marine animals in a process called “ghost fishing”. Every year they are responsible for trapping and killing millions of marine animals, including turtles. Researchers believe that around 640,000 tons of ghost gear is produced every single year. 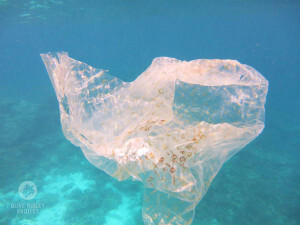 Plastic floating in the ocean can easily be mistaken for jellyfish – a favourite food for turtles. Marine debris also poses a significant problem to critically endangered hawksbills, as well as all other sea turtle species. It is estimated that there are more than 100 million tonnes of plastic in the ocean, responsible for killing more than 100 million marine animals each year. It is believed that almost all sea turtles will ingest plastic in some form during their life. This is a particular problem for sea turtles as the downward-facing spines lining their throat prevent regurgitation of ingested plastic. The plastic can fill the stomach of the turtle and thus prevent it from swallowing real food, subsequently causing the turtle to starve. Plastic and other marine debris can also block the movement of food within the gastrointestinal tract which can have severe health implications. 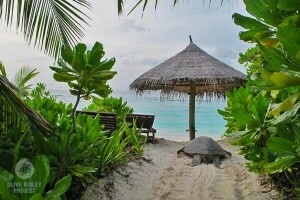 A nesting Green turtle makes her way around some beach furniture at a resort in the Maldives. Coastal development can result in significant beach erosion and the loss of crucial nesting habitat. Erosion can leave little space for nesting female sea turtles to lay their eggs. This, in turn, increases the likelihood of nesting below the high tide line, increasing the risk of nest flooding and failure. Sea defences designed to prevent erosion can also pose a problem by blocking access to suitable nesting habitat further up the beach. Beach furniture and recreation equipment left on the beach can become obstacles to both nesting females and emerging hatchlings, and can ultimately reduce nesting success. Tourist use of beaches at night may also disturb nesting females and could prevent nesting activity entirely. Artificial lights on nesting beaches confuse and disorientate nesting females and hatchlings. As a result, turtles inadvertently head inland rather than back toward the sea. This increases the risk of being caught by predators and death due to dehydration or exhaustion. Climate change is another significant threat to hawksbills. Hawksbills’ primary foraging habitat are coral reef ecosystems, which are severely threatened by temperature change. 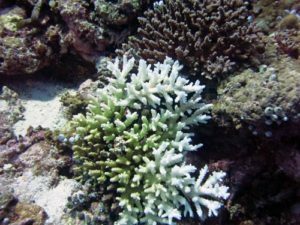 An increase in global temperature and associated coral bleaching events could have a devastating impact both on coral reefs and on hawksbill populations. Despite the many threats facing hawksbill turtles, there remains hope for hawksbill turtle populations. 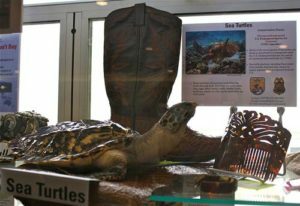 Public interest in hawksbills and other sea turtle species is at an all-time high and the demand for ecotourism is growing exponentially. As a result, funds available for research are increasing. Through this research, conservationists can identify population hot-spots, providing vital information that can be used to implement protective legislation. Click here to find out more about the research Olive Ridley Project is currently undertaking. Mortimer & Donnelly (2008) “Eretmochelys imbricata The IUCN Red List of Threatened Species 2008”.